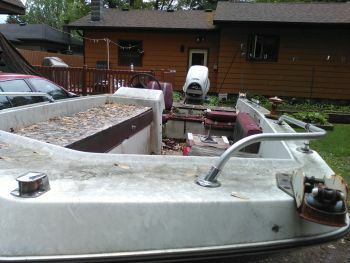 Been looking into starting my first boat project for a while now. 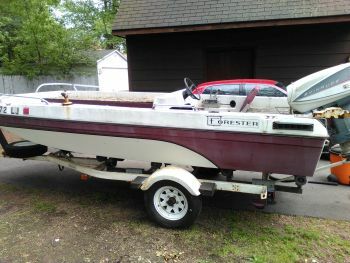 Finally found the right boat for the right price. 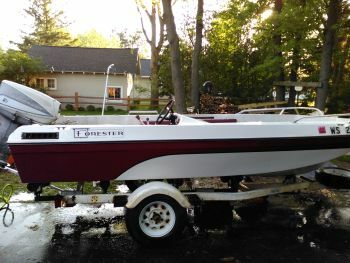 She's a 1980 Forester 15' with a 1950's (I think) Evinrude 40. Picked up for $350. She runs and floats. It had been sitting behind the guys house, uncovered, for 3 years. Brought it home and starting tearing all the rotten stuff out. Next step will be to get that old motor running. The interior before I cleaned it out. After taking a few different sized brushes and some bleach to the top and a pressure washer to the bottom. Looking good!!! Motor is '60's vintage, post model and serial numbers for exact I.D. On a plate riveted to the motor's transom clamp bracket. I looked up the serial number for the motor. Its a 1967 Evinrude 40 Big Twin. From what I've read they seem to be damn good motors. I am currently having 1 problem with it though. Went to start it today after taking all the proper steps to starting an old motor that hasn't been starting in a long time, and the starter stuck on/engaged even after I turned the key off. Not too sure what that means, but I'm doing some research to figure it out. If you mean the gear didn't drop, spray the gear shaft with WD-40. They get sticky if they sit too long. No it wasn't that. It ended up being the starter solenoid sticking.